Many tech blogs say that Google Buzz is an unsuccessful project and Google will have to abandon it. Google Buzz is not an experimental service like Google Wave, it’s an extremely important project for Google’s future and it’s a key component of Google’s social strategy. To see how important is Google Buzz for Google, consider that Buzz wasn’t launched in Google Labs. It wasn’t even launched as a standalone service: Google Buzz was integrated with Gmail, one of the most popular Google products. Google Buzz is also the only Google service that has a special icon and a special search command on Google’s mobile site. In less than 7 months since Buzz’s launch, the service already has a powerful API, it’s integrated with Google Maps, Google Reader, Picasa Web Albums and it’s constantly improving. Google Buzz is actually the service planned in 2007 whose goal was to integrate Google’s social applications and become the central place for sharing photos, documents, videos, news with your contacts. 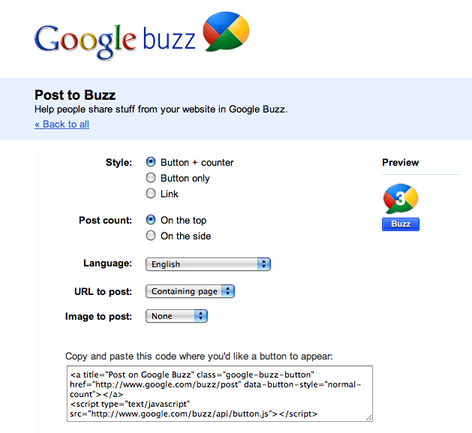 Google Buzz already streams some activities from Google Reader, Picasa Web Albums, Blogger, YouTube. Google Buzz also added two other important features: muting posts by source, so you can hide someone’s Twitter posts, Flickr photos or the posts from another source, and editing posts and comments from the mobile interface. It should be clear that Google Buzz is here to stay, even as a feature of a future service. 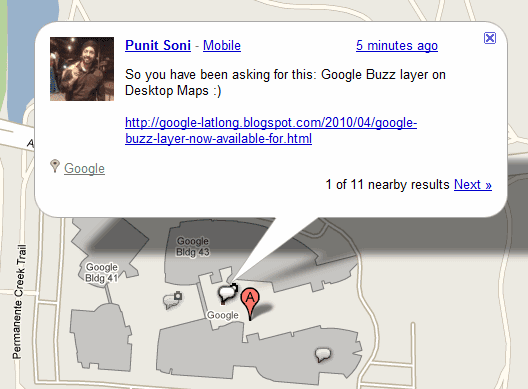 Lots of people using Google Buzz to share interesting links from around the web. To do so, you had to copy and paste the link from one browser window to another — there weren’t buttons that made it easy to post to Google Buzz without leaving the site you’re on. 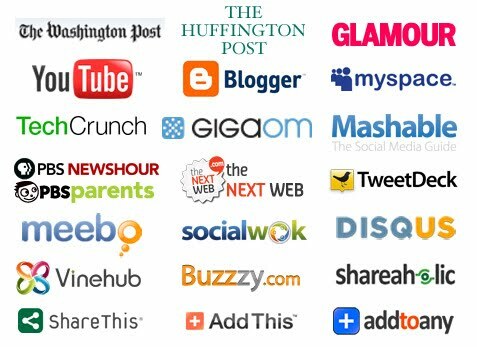 Savvy sites like Mashable and TechCrunch quickly got creative and implemented their own Buzz buttons, using Google Reader as the backend. But not every site owner should have to hack together their own version of these buttons (and not everyone who uses Buzz also uses Reader), so this morning we’re making copy-and-paste Buzz buttons available for anyone to use. 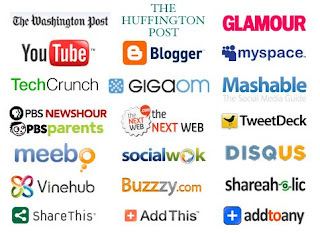 Starting today, you’ll see these buttons around the web on participating sites including: The Washington Post, The Huffington Post, Glamour, YouTube, Blogger, MySpace, GigaOM, PBS Parents, PBS NewsHour, The Next Web, TweetDeck, SocialWok, Disqus, Vinehub, and Buzzzy. Mashable and TechCrunch have updated their sites to use these new buttons too. 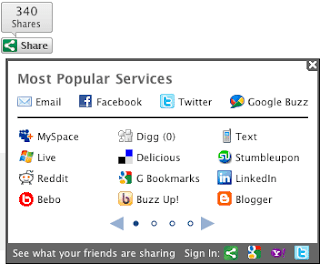 A number of sharing platforms, including ShareThis (pictured below), Meebo, Shareholic, AddThis and AddtoAny have also incorporated the Google Buzz button into their sharing functionality, so you’ll see Buzz listed as a choice when you go to share something on many other sites around the web as well. Google Buzz was pushed out the door too early and force-fed to users by placing it in Gmail. The launch has been marked by both privacy and usability issues. But the team at Google behind it, led by Bradley Horowitz, is working hard to fix problems and respond to user feedback. In fact, earlier today, Horowitz pointed people via Buzz and Twitter to an official Google product idea site for making suggestions to improve Google Buzz. The site is powered by Google Moderator, which lets people suggest ideas and then vote them up or down. Below are the top ten ideas and feature requests on the site right now, which already has 13,607 votes on 338 ideas from 692 people. They range from making comments more manageable to fixing Twitter update imports so that they are more realtime to better filters and a ReBuzz button. Hmm, sounds like people want it to be even more like FriendFeed. What’s your top feature request for Buzz? Google Reader rolled out a nice little update that added a new “Popular items” feed to the “Explore” area of the service. In here, you would find items from around the web that were gaining popularity fast. Of course, one person’s gem of popular content is another person’s crappy video. So today, Google has rolled out another update to Reader, to recommend items more personally tailored to you. The new “Recommended items” feed replaces the “Popular items” feed in the same Explore area. “With the latest round of improvements, we’ve started inserting items selected just for you inside the Recommended items section,” Google writes. What’s not entirely clear from Google’s post is how they’re pulling together these recommendations for Reader users. I have to assume it’s the same way they’ve long recommended news feeds to you, which is by looking at your Reader Trends and web browsing history (if you have that turned on), and comparing it with other users. A quick scan of my own new Recommended items area shows results that are pretty hit-or-miss. But maybe that’s because I’m a writer who has to scan hundreds of sites every day even if not all of them particularly interest me. There’s another small new feature in Reader today too: related feeds. If you trigger the drop down menu on a certain feed, and hover over “More like this,” you’ll see a list of feeds for what Reader considers to be similar sites. Subscribing to them is then just a button click away. Using Google Reader this past week has been interesting as Google Buzz has multiplied the number of users following the items I share several times over. This is of course because Buzz and Reader (and the other Google properties) share the same social graph now — the same highly controversial social graph which saw you automatically friending certain people you contact on Gmail or over IM. In fact, Google had to stop doing that. I’m still not sure Reader, or Google as a whole, gets this whole social thing, but they’re certainly growing their graph quickly now. Well after bit of researching I was able to find out how to create Google Buzz Button which you can add to your blog such as wordpress or blogger etc so your audience can share posts via Google Buzz. Unlike some blogger they tend to make it very secretive others love to share it. WordPress Users: Go to your Theme Editor look for single.php file , and just play with it where you want to embed this code. Bloggers: My suggestion is to maybe create another small Script widget add this code and embed it at the bottom. You can do that by going to Layout Setting. Feel free to use and change everything! If you have suggestions to the code above please share with us! Just two days in and Google is already sharing some Google Buzz stats and improvements. Notably, the company says that there are already “tens of million of people” checking out Buzz, and that 9 million posts and comments have been created in these first two days. They’re also seeing over 200 posts per minute from mobile phones. But amid the huge usage, Google is getting a lot of criticism for the way Buzz is currently implemented. The good news is that they appear to be listening and quickly responding. Later today, Google says that they will create a more obvious way to hide your follower count. This has been an issue as it potentially exposes who you email and/or chat with the most. Also new is the immediate ability to block anyone who starts following you. Finally, Google will make it easier to see what people will show up on your “following you” public page. This was (and still is) tricky because only users with public profiles show up there, but it wasn’t obvious who that was. It’s good to see Google reacting so quickly to some of the feedback they’re getting. That said, there remains a lot of work to be done with Buzz. The main problem I have with it is that it’s entirely too noisy and there is no good way to turn that down without unfollowing people. Basically, you have to take the “social” out of the social network for it to be most useful. It seems that there are simply some UI/UX tweaks they could do to correct this. There’s another another potential security issue with Buzz that we’ve been looking into and will be posting on soon. These updates apparently do not correct that. Stay tuned. What is Google Buzz ? Google Buzz is a New Exiting social network and sharing product built by Google. 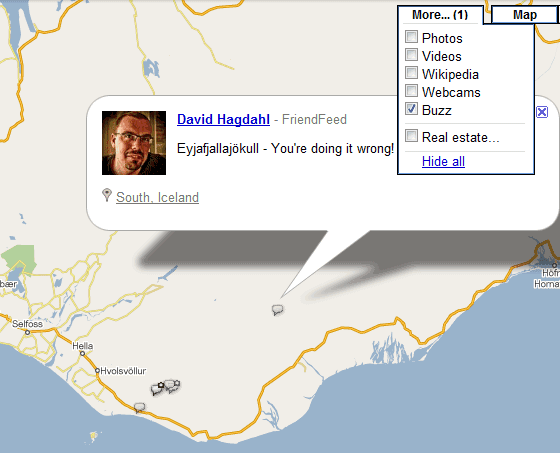 Based within Google Profiles, Buzz offers a stream of status updates, pictures, links, and videos from your friends. You can “like” these items and you can comment on them. 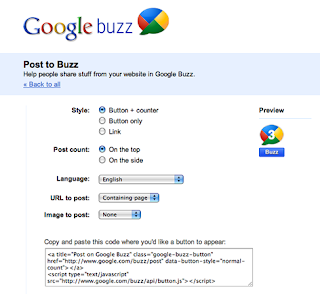 Updates from Flickr, Picasa, Google Reader, or Twitter can also be automatically imported into a Buzz stream. Buzz will recommend items you might like based on your friends’ activity. Posted on February 12, 2010 February 12, 2010 Author Steven WallCategories Featured, General, Google, Google API, Technology NewsTags Google Buzz1 Comment on What is Google Buzz ?